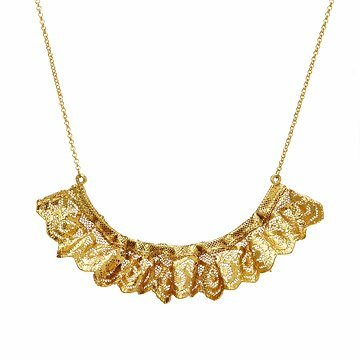 Make a romantic statement with this stunning necklace, made from lace dipped in gold. Make a rare and romantic statement with Tulianna and Alejandra Garces' necklace that combines the timeless qualities of lace and gold. In a painstaking process taking several days, Colombian artisans transform lace into stunning, finely-detailed jewelry. The process is entirely done by hand: pieces of lace are cut and sewn, dipped in wax to seal and reinforce them, then in a layer of copper, and finally in 24k gold. The piece is then brushed by hand, clearing every void of the lace from excess metal to preserve its subtle detail. Finally, a lacquer is brushed onto each piece to protect its delicate beauty. Produced through a fair trade organization, this handmade jewelry provides stable income for economically struggling or displaced communities of Colombian artisans (85% are women and heads of households). The resulting pieces are glittering tributes to the traditional art of lacemaking, and gorgeous statements to add to your accessory collection.